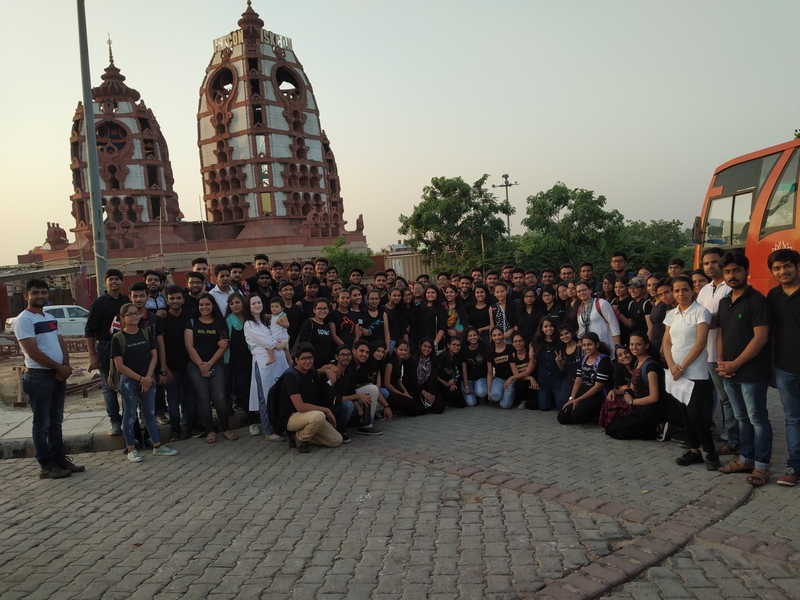 Gateway College of Architecture & Design had organized an excursion to “Iskon Temple”. It was organized to provide them an exposure towards the “Temples” as well as to break the stereotype thought towards temples. The International Society for Krishna Consciousness (ISKCON) is a Hindu religious organization. ISKCON was founded in 1966 in New York City. ISKCON was formed to spread the practice of spiritual path in which devotees dedicate their thoughts and actions towards pleasing, Krishna, their Supreme Lord. ISKCON as of 2017 is a worldwide chain of more than 850 temples and centres, farm communities, schools and restaurants. ISKCON temple, which we visited is a well known Lord Krishna temple opened in 1998, on Hare Krishna Hills (near Nehru Place), in the East of Kailash area, New Delhi, India. It is designed by “Ar. A.P. Kanvinde. Our intent was to sensitize the first year students with the architecture of this temple. The best part of this temple is that the natural terrain of the site has been used which was sloping in nature. There was a slope of 8 m. in relation to road level. This inspired our students to study the natural site at very first stage. Deity spaces are located at the highest level. Reinforced concrete framed structure is cladded with red sandstone and white marble. Students visited the museum, small shopping areas, restaurants and offices. Temple is around an informal court with sunk garden and spaces. We enjoyed the cascades and waterfalls all around which is creating microclimate in the harsh climate of Delhi. On the whole students learnt that “Temples” can’t be neglected. Its not just placing of an idol in a space or just a walled closure created around a naturally emerged rock. Such discussions were held there among students and faculties. They experienced that good design of any space and their linking with other required spaces with added interesting elements can give life to the structure. One can come to sit peacefully here more rather than just chanting “Hare Rama, Hare Krishna” externally but not feeling peaceful from inside. Placing of beautiful idols can be one’s choice. But good architecture with beautiful spaces and cleanliness around can also help in connecting with God. Students drew sketches, took photographs and discussed about the thoughts behind every major component of the structure such as “Shikhara” of the temple. It was a learning and enjoyable experience in all. This trip helped them to sense that learning architecture just not deals with malls or some fancy structures. It can also be the development of any sacred site. 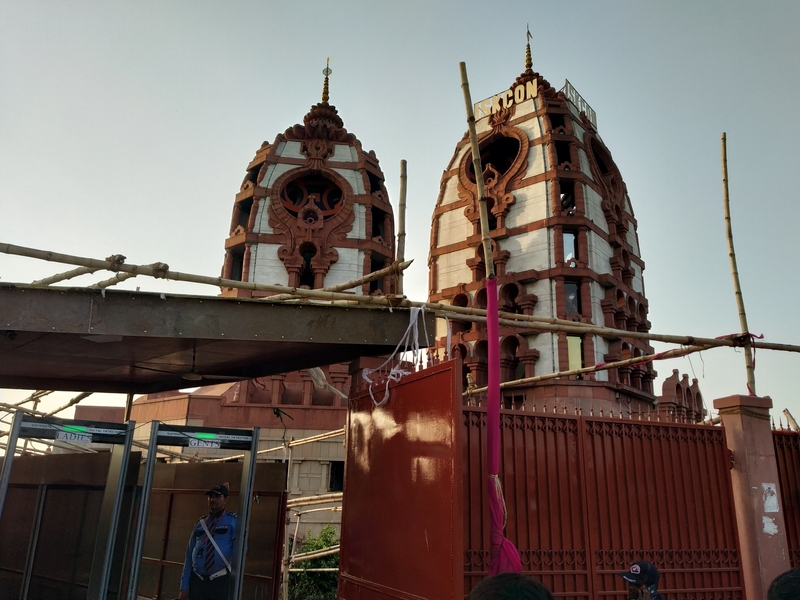 With our knowledge, how we Architects can solve the problems faced in traditional temples with our new ideas and concepts, not disturbing anyone’s sentiments.